Women are 47% more likely than men to be injured in a car crash. Around the world, the achievements of women are being celebrated on International Women’s Day, which began back in 1911. But the day also highlights the work that remains to be done in order to achieve gender parity. The theme for this year is #BalanceforBetter - encapsulating the idea that a gender-balanced world benefits everyone, economically and socially. And it’s up to everyone, men and women, to make it happen. As the following statistics show, there are huge differences in the types of inequality faced by women in different parts of the world - from cultural representation, to domestic burdens and child marriage. But through collective action and shared ownership, change is possible. In their 2011 study of more than 45,000 crash victims over 11 years, researchers from the University of Virginia found women drivers were much more likely to be injured in a crash than men. They said this was because car safety features had been designed for men. The positioning of head restraints, as well as women’s shorter height, different neck strength and musculature, as well as their preferred seating position, meant they were more susceptible to injury. Globally, 12 million girls each year get married before the age of 18 - roughly 33,000 every day, or one every two seconds. There are some 650 million women alive today who were child brides. The reasons behind it vary between communities, but it’s often because girls are not valued as highly as boys and marrying them off at a young age transfers the ‘economic burden’ to another family. 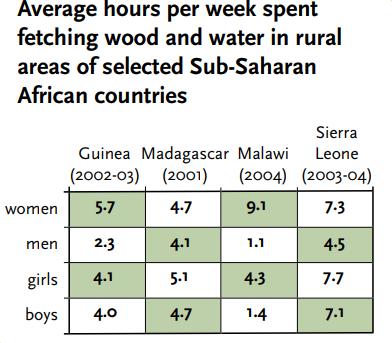 In rural parts of sub-Saharan Africa, a lack of services and infrastructure, combined with an expectation of household duties and limited employment opportunities for women, means they shoulder an unequal burden of gathering water and wood for their families. According to the UN, collectively these women spend 40 billion hours a year collecting water. At the current rate of progress, it will take another 108 years to reach gender parity, according to the World Economic Forum’s most recent Global Gender Gap report. Across the 106 countries covered since the first edition of the report, the biggest gaps to close are in the economic and political empowerment dimensions, which will take 202 and 107 years to close, respectively. The World Bank’s recent Women, Business and the Law report measured gender discrimination in 187 countries. It found that only Belgium, Denmark, France, Latvia, Luxembourg and Sweden scored full marks on eight indicators - from receiving a pension to freedom of movement - influencing economic decisions women make during their careers. A typical economy only gives women three-quarters the rights of men in the measured areas. According to the Forum’s Global Gender Gap report, only 22% of the world's AI professionals are female, compared with 78% who are male. This accounts for a gender gap of 72% yet to close - and reflects the broader STEM skills gap. 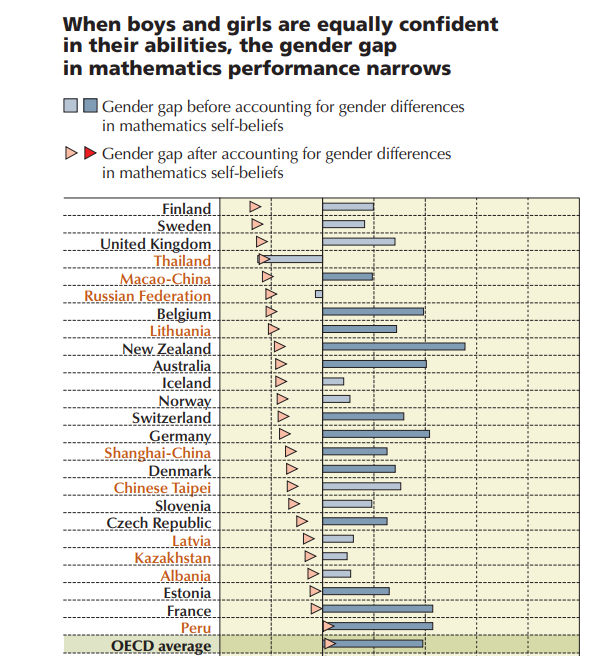 In 2012, just 14% of women starting university in OECD countries chose science-related subjects, compared with 39% of men. A 2015 PISA report found even high-achieving girls underachieved when they were asked to ‘think like scientists’. Girls were less confident at solving science and maths problems and reported higher levels of anxiety towards maths. In a study of students at Cornell University in 2003, psychologists found that women rated their scientific abilities lower than men, even though they performed roughly the same in a quiz. The Geena Davis Institute analysed 120 theatrical releases between 2010 and 2013 in 10 countries - and found that of the 5,799 speaking or named characters, less than a third (30.9%) were female and more than a third (69.1%) were male.